H & H provides stellar Service for PoolPak Dehumidification Systems. H&H Commercial Services, Inc. services and installs PoolPak’s dehumidification systems. PoolPak dehumidifiers can be found in pool facilities, schools/universities and health facilities not just in Philadelphia City or nationally, but internationally as well. 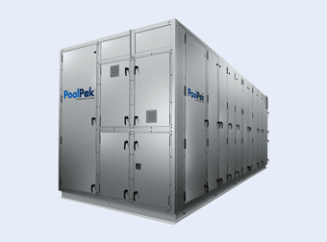 PoolPak manufactures a full line of dehumidification systems designed for indoor pool applications. Both mechanical refrigeration and outside air systems: Mechanical refrigeration recycles the heat captured during dehumidification to heat the air or water while the outside air system effectively captures heat from the exhaust air stream. PoolComPak engineered specifically for smaller applications: It is available in a variety of sizes and configurations with a moisture removal capacity of approximately 60lb/hr. Customizable MPK and SWHP and VHR systems: They can be tailored to fit your particular facility and location. Basic units are available for dehumidification and heating while others can include exhaust and purge control. High capacity, energy-efficient dehumidification systems: This includes the PoolPak HCDV and HCDH Series which will recycle heat back to the space, reducing energy costs. Skilled Maintenance, Installation and Repair of PoolPak Dehumidification Systems. Quality of installation service is as important as the qualitty of your dehumidification system. Proper sizing, setup and calibration reduce the likelihood of performance issues, sudden breakdowns and expensive repairs. With H&H Commercial Services, Inc. you have the assurance that a trained and experienced technician will be deployed for the job. We offer a skilled maintenance and repair service to keep your system in good working condition for years to come. Customer satisfaction is our top priority and we are proud to say that over the past 30 years our business has grown largely from referrals. You can count on us for the right advice. Contact H&H Commercial Services, Inc. now at 610-532-8745 for the latest dehumidification systems in Philadelphia and the TriState Area from PoolPak and other trusted manufacturers.